The Miracle League is a children's baseball organization. Perhaps something like the Little League, it is the center of the world for the kids that participate. But the Miracle League is a dream come true for many children with disabilities. Every kid, regardless of disability can be a winner in the Miracle League. Watch this Today Show feature on the Miracle League to understand more about the Miracle League. Then read the interview with Diane Alford, the Executive Director of the Miracle League below. Gene Emmer: Can you tell me a bit about the Miracle League? Diane Alford: The Miracle League has put an aggressive plan for construction of special Miracle Baseball Leagues and specially built rubber sports surface fields around the globe. The goal is to build as many Miracle League complexes as possible in order to serve children with special needs. 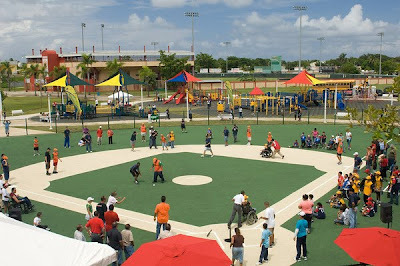 Presently the Miracle League has 235 plus Miracle League Organizations across the country including Puerto Rico , serving 185,000 children and young adults. This is different than any other baseball game I have seen. How does a game work? Are there any other rules? Are there age limits to the players? DA: Our games are two inning ball games, lasting approximatley 1 1/2 hours, therefore each players gets to bat each inning. Take the bases and score for their team. But its more than just the game, its about making new friends, building self esteem and just having FUN! GE: I understand the Miracle League started about 10 years ago and now you have around 200 organizations and your goal is 500 organizations serving 1.3 million children. That is amazing! DA: There are over 10 million children and young adults in the US with disabilities, we have a great task before us but are truly up for it.... Every community should have a Miracle League. GE What is behind the rapid growth rate? DA: The lack of and in most cases no programs at all for individuals with disabilities. We were blessed this past fall season to have over 180,000 children and young adults participating in the Miracle League Programs. GE: How do you usually get new organizations? Does someone in the league go out and find someone to start them? Or do you wait for someone to contact you? DA: Our original plan was to visit different communities and get them involved, however we have been blessed everyday we received over 400 emails and phone calls wanting to get involved with the Miracle League and bring Miracle League baseball to their communities. 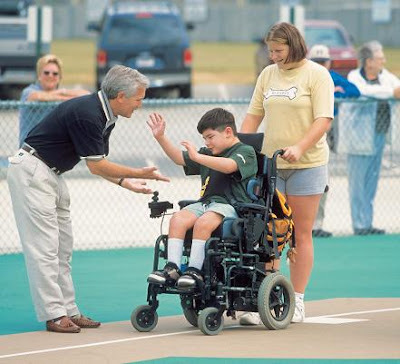 GE: Do you have Miracle League organizations in all of the US states? Do you have any miracle leagues outside of the USA? GE: Are there any locations you would really like to see come on board? DA: We are looking at Mexico and the Dominican Republic. GE: What is your role in the Miracle League? DA: The Miracle League is a membership organization through our member the National Miracle League office is committed to helping each community in bringing a Miracle League to their community. We consult in building, the organization, the league and the special rubberized field. GE: What kind of support or interactions do you provide with the local organization? DA: We actually visit the communities, work with the local Miracle Leagues, we supply our member a Miracle League Manual and the actually architectural drawings, we help with fundraisers attend Grand Opening Days. GE. Is there anything I didn't ask that you would like to add? DA: The Miracle League will enrich the lives of children with disabilities as well as their families and their communities. 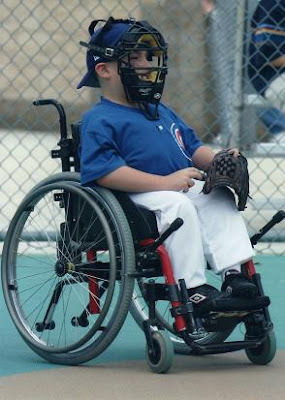 It demonstrates to children with disabilities that they are not limited by their disability but can take the advantage of such an opportunity to play America ’s favorite pass time baseball, just like their brothers, sisters and friends. When a kid crosses home plate it gives their parents such joy to see their child play baseball just like all other boys and girls. The community achieves much when it works together to produce such an outstanding project as a Miracle League and a Miracle League Field.